← Week 2 – Question of the Week: Which herbal medicines do you believe in? I’m an allopathic doctor. That means I prescribe pills. Along with the rest of the established medical profession, I have “looked down my nose” at those who tout the superiority of plants and herbs. Now I’m not so sure. Still, I remain skeptical of those with a high profit motive and extremely limited medical knowledge. Discovering that an herb may have an effect on the mouse thyroid does not make it a proven weight-loss drug for humans. If you read the fine print on nutraceutical products, you’ll see that, despite their claims, they are “not intended for any medicinal use.” If you investigate the science behind the claims, you’ll likely find it is scanty indeed. On the other hand, some of our most useful drugs are derived from the natural world: aspirin, botox, curare, penicillin, digoxin, morphine, to name a few. I remember as a youthful MD smugly explaining why pharmaceutical drugs are superior. For example, why is digoxin better than foxglove? The pill contains a single, purified, active ingredient in a precise, predictable dosage. But is 0.25 mg of digoxin the equivalent of one foxglove leaf or 10? Plants or stems? We know the safe dose of digoxin, but might a strong cup of foxglove tea kill your grandmother? There are dangers of using herbal products. Just because something is natural does not make it safe, as in poison mushrooms or even pure oxygen. Yet I believe God has given us the natural world to benefit us (and not primarily Big Pharma). Medical science has greatly expanded our understanding of the microscopic, chemical, biologic, immunologic, and genetic sciences. Perhaps it is time to marry the two together. Some claim that at TEOTWAWKI we’ll be plunged into medical care of two centuries ago. But if the knowledge base is preserved, even apart from the manufacturing capability, at least we’ll know better how to preserve life, avoid infection, rehydrate patients, and not harm our loved-ones in the process with dangerous therapies now proven to be ineffective. When I read sites on herbal medicine I despair at the lack of objectivity. Grandma’s remedies may have worked just because she was Grandma. 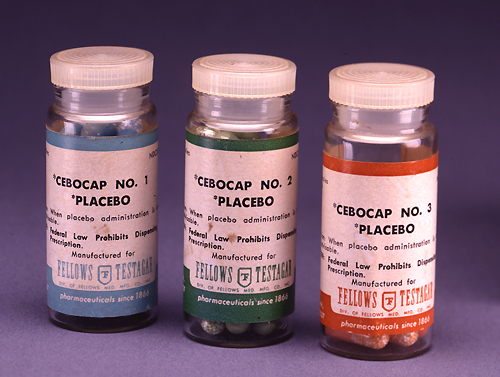 Medical science has a tough time separating this placebo effect from a true effect. And if Granny’s favorite potion worked every time (which is certainly not true of any pharmaceutical product), maybe what people need most is a Granny. I don’t want this site to be another source of questionable information. I have asked our medical professionals to contribute (see Question of the Week#2), and their opinions run the gamut. Researching the hard science is time-consuming, and there just isn’t much out there to support clinical use. But that doesn’t mean plant-based therapies don’t exist. We just don’t understand them well enough yet. So my own thinking has undergone a gradual transition and this summer I plan to plant a medicinal herb garden and do some experimenting of my own. As time goes on, I hope to offer additional articles on proven therapies, something you can both trust and use. This entry was posted in Diseases, Herbal and complementary, Herbal medicine, Medical archives, Medications, Prescription Medications, See medications - herbal and tagged Alternative, Health, Herb, Herbalism, Medicine, Pharmaceutical drug. Bookmark the permalink. A supremely invaluable resource would be a waterproof spiral-bound paper book which describes how, with extremely basic resources such as would be found in 90% of houses, to reproduce known quantities of medicine. For example, I’ve downloaded recipes for aspirin, penicillin and morphine. I believe the risk of getting it wrong and killing a person would be great (which may be why this is hard to find) but it must be done. Maybe it could be wrapped in a disclaimer that you must pull off first, with another disclaimer on the cover and in the first pages.. Thought you might like to know that we completely got rid of our 7 year old daughter’s MRSA infection with Garlic. Antibiotics only worked temporarily and it kept coming back. We tried other natural things that didn’t work, so we know it isn’t the placebo effect. The placebo effect is greatly overrated IMHO. We also effectively got rid of our two sons’ ear infections with a few drops of diluted tea tree oil and colloidal silver in the ear. Not sure if it was one or the other or both, but we will experiment if it happens again by trying only one at first. We knew they had an infection without needing to go to a doctor to prove it because the ear was red, hot, and they were touching it, and putting a hand on it helped to relieve the pressure. One son is 6 so he told us his ear hurt, but the other son is 1 so he can’t talk yet to even tell us. He was just crying and showing the above symptoms. Only about an hour after the first dose, the pain was gone! Then we repeated a couple other times that day just to make sure we killed all of the bacteria. The interesting thing is that natural medicine works in more ways than conventional so it is more effective when it does work. Garlic has NUMEROUS ways that it attacks the bacteria or virus, for example, so it doesn’t take 10 days of taking it like man-made antibiotics do. It’s really sad that MD’s are trained to be so skeptical of natural medicine even though SO many have avoided the terrible side effects of the unnatural (or even death) by using this approach. I’m really glad you are thinking outside the box and doing a little experimenting! Sloop makes a number of good points and raises several questions. 1. Doctors do need ways to cure infections other than antibiotics, which are not effective in many situations. 2. Close observation is needed to determine whether an entity is effective. In the outpatient setting doctors rarely have the opportunity to observe the effects of a particular remedy over the course of several hours, and therefore rely on reports of observant parents. 3. After an Armageddon event, doctors and patients may need to rely on simple clinical criteria to establish a diagnosis and decide treatment. 4. The problem with the above is it is largely anecdotal. The pain of ear infections often resolves in a matter of hours anyway. Was it the cure due to the medicine or the patient’s own immunity? If we say a natural medicine works in several ways, just what are these several ways? 5. With a middle ear infection, the ear drum sometimes bursts. Doctors are very careful about instilling any potentially harmful medication into the ear, for fear of permanent damage to the middle ear, resulting in hearing loss. I cannot say what the effects of colloidal silver to diluted tea tree oil would be on the middle ear and hence cannot recommend. Pain medications help an ear infection as much as anything, and antibiotics are not indicated for minor ear infections anyway. 6. All that said, we still need to look for new ways to treating minor infections, reserving antibiotics for life-threateniing situations. Re: supplments and herbal medicine, one hint may be to look to Europe, where nutricueticals are more closely supervised, regulated and tested – but also in many cases more available. I raise medicinal herbs as a hobby. Some of them have actual use that works, some are just “traditional”. They fascinate me though, partly because of the ones that *do* work and partly because of the hype and hysteria surrounding them. Some of them have been overharvested in the wild and are endangered. I’m glad to see an MD expressing interest in experimenting. 5) Rose hips. Good source of vitamin C that also stores well. 6) Garlic. Antiinfective properties well demonstrated, as well as antivampiric effects! 7) Feverfew for migraines, although rebound is a problem for some. I have picked things that grow in my home area. There are others I would love to include, such as aloe vera, tea tree oil, ginger, etc, but figure those would be just as hard to find as conventional meds. 3) Willow bark. Original source of aspirin. Makes a truly horrific tasting tea, but easy to find, easy to make and effective. 4) Ecchinacea purpurae. Purple coneflower. The root can be made into a tincture which has been shown to effectively stimulate the immune system and shorten duration of viral infections if taken early. Must be noted that if taken for extended periods, it becomes an immune suppressant. Also contraindicated for folks dealing with autoimmune diseases. 1) Honey. Seriously, honey. Probably the most overlooked “herbal” out there. Has been used as a topical antiinfective for centuries and has a significant number of studies to back it up. Also affective for pollen allergies, if you consume locally produced product. 2) Opium. Yes, I said opium. The poppy grows like a weed here. It must be noted that any experimentaion in this area is very likely to attract legal attention of the worst sort, but it makes a very effective pain killer. You will have to look up recipes on your own, though. I’m not opposed to pharmaceuticals; quite the contrary, I take a daily medication for migraine prevention (which has reduced the frequency of my migraines by 2/3) and I was widowed 18 years ago at the age of 23 because my husband suffered from bipolar disorder but refused to take his medication, which led to his suicide. But I dislike relying on prescription medication, and while I have serious skepticism of most people’s claims that herbal medicines are always superior, in recent years I’ve acquired more of an open mind regarding the potential of herbal drugs. While I won’t be tossing my prescriptions in the foreseeable future, I will be (slowly and carefully) experimenting with plants that may help my family’s particular medical needs. For example, we used to take OTC drugs for occasional sleeplessness, but now we all use a herbal supplement containing chamomile, valerian & melatonin — which does seem to work beautifully, with none of the after-effects of “chemical” drugs. Interestingly enough, when I recently developed a (rare for me, thankfully!) UTI, my MD suggested that I try taking cranberry powder tablets and pushing fluids for a few days before requesting antibiotics. Maybe his suggestion to try “natural” remedies first had something to do with him being from Australia, or maybe it was just common sense (as I’d already tried a few days of the cranberry powder before I asked for antibiotics!). Sorry to hear about your husband. I, too, had a friend who committed suicide while off his meds. Very sad. In my opinion, the problem with this attempt to broaden the discussion is that in general those who believe in herbs and supplements do so out of a religious-like faith and are unable to be rational in their approach to this issue. They will be unaware of their bizarre ideas and the tenuous source of their “knowledge”. They will ignore any real scientific investigation of the value of herbs and point to the centuries of superstition based “medicine” that has used herbs and supplements. This is quite different from a rational discussion based on facts and common sense. It will be a lose/lose proposition. I can’t say I disagree, but yet we can’t ignore the question altogether. Aside from reading journal articles, doctors are largely unequipped to expand the field. Many a time I told my own father that the herbs he took could not compensate for a blood sugar of 300. Even among the answers I’ve received on the question of the week, there are some pearls of knowledge intermixed with what appears to be blind enthusiasm or personal experience. Thanks for your thoughtful comment.